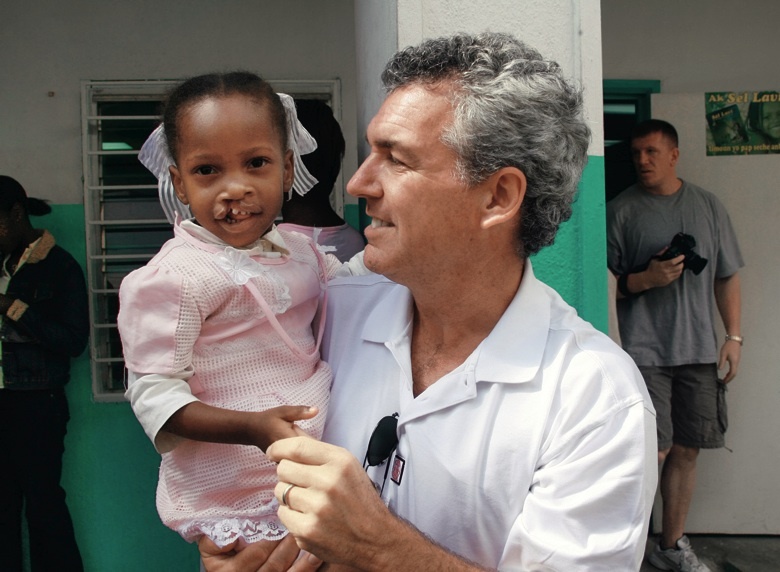 Brian Mullaney with a Haitian patient before her surgery this past February. Smile Train has provided roughly 160 surgeries in Haiti and recently launched “Cleft-free Haiti” to completely eradicate cleft there. Smile Train has been especially active in China. 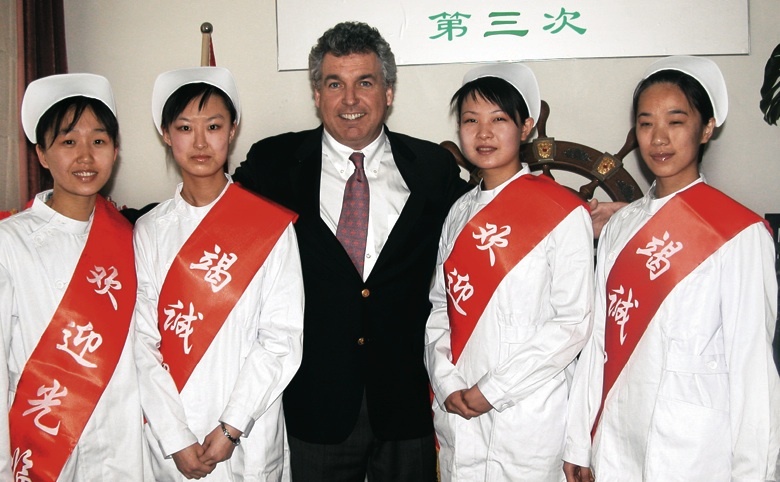 Mullaney met these four nurses from Jinzhong No. 1 People’s Hospital, one of its partner institutions, in 2005. 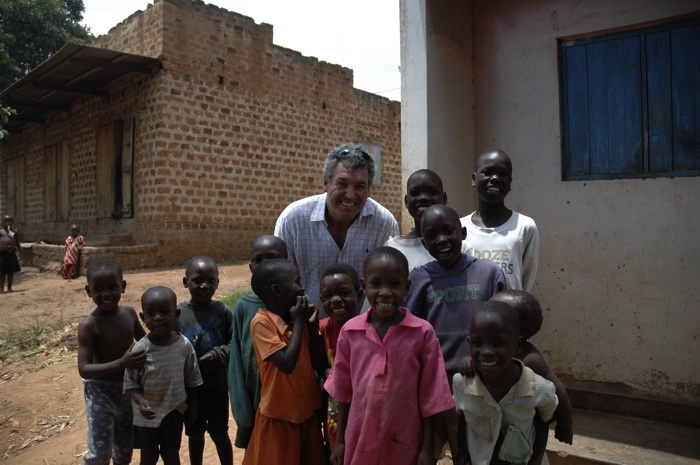 Smile Train has provided 2,350 surgeries to date in Uganda, where this photograph was taken in 2005. Pinki Sonkar, whose surgery took place in March 2007, celebrated with Mullaney this past February, the day after Smile Pinki, a documentary about Smile Train's work, won an Oscar. Ever the entrepreneur, he chose to focus on what had been a philanthropic pastime: correcting facial disfigurements in poor children. He became the co-founder of Smile Train, now the largest charity devoted to fixing cleft lip and palate injuries around the world. Cleft injury, the most common birth defect in the United States, affects one in every 594 newborns, or 6,800 infants per year, according to the Cleft Palate Foundation. Most of these babies receive surgery within three to six months. In developing countries, however, such deformities are far more numerous, and typically go untreated: Smile Train estimates there are 160,000 new cases a year and a 4.6-million-case backlog. Though rarely life-threatening, clefts can lead to social ostracism and psychological scarring, as well as severe practical problems: the afflicted children often do not attend school, get jobs, or marry. “A lot of these kids can’t talk, or talk well,” Mullaney reports. “They sound retarded and they are treated like freaks, like the Elephant Man.” Cultural prejudices also abound, some linking the children to evil spirits or Satan, making the condition harder for entire families to bear; in India, Mullaney says, there have even been reports of midwives being paid to smother such babies, especially girls, at birth. The psychosocial impact of clefts is brought home in Smile Pinki, a 2008 film about the charity’s work in India that won an Oscar for best short documentary (a goal Mullaney had set out to achieve about three years earlier). “These surgeries transform these kids’ lives,” he says. Mullaney first started caring about children with deformities long before his own kids were born. He was working on advertising accounts for Park Avenue cosmetic surgeons, he recalls: “I’d ride the subway to their offices and see all these kids, mostly immigrant and poor children, with giant port-wine stains or a hairy nevus across their face, kids with six fingers, or missing an ear, or a scar that was wide open, or horrible teeth, and I knew my surgeons could fix those,” he says. In 1991, while running Schell/Mullaney, he founded a pilot program that offered free surgeries to city kids; ultimately, it grew to include the entire metropolitan school district. Surgeons did the work pro bono, while Mullaney raised funds to cover operating expenses. One day, he saw an article in People magazine about a Virginia-based charity with the same name as his: Operation Smile. He called them up, and by 1994 the two groups had merged to focus on cleft injuries internationally, using two-week medical missions. The impact of these surgeries hit Mullaney on his first of many trips to China, when he was allowed to scrub into an operation on a nine-year-old whose name meant Beautiful Cloud. “When she woke up in the recovery room, they brought in a mirror and handed it to her—and I will never forget how her hands were trembling and she stared into the mirror and didn’t say a word, and nine years of tears ran down her face.” He felt he had “witnessed a miracle” and returned to New York “like a man on a mission and began raising millions of dollars for Operation Smile from everyone and anyone I knew.” The exposure to charity work in the world’s poorest corners “fundamentally reset” his values, he says: “I get the bends like a deep-sea diver going between” his two worlds. In 1997, he and Wang (who is as high profile in his philanthropies as in his sometimes controversial business practices) devised the idea of Smile Train. Mullaney says Wang, who immigrated to the United States as a boy, still identifies strongly with China and questioned why Operation Smile did not utilize Chinese surgeons. Over time, Wang and Mullaney worked with then U.S. and Chinese presidents George H.W. Bush and Jiang Zemin to pave the way for training local surgeons and supporting hospitals in some of that country’s poorest regions. In 1998, they split from Operation Smile and established their own organization. Wang, as chairman of the board, put up the initial $70 million: $30 million of his own, $40 million that he raised from friends. That money, Mullaney’s sweat equity, and their high-level connections put Smile Train on track. He believes in operating a small, focused, creative group of people who brainstorm and daydream to generate “big ideas.” One such session spawned the notion of a feature film about clefts. So much of the health and medical news from “developing countries—malaria and AIDS—is bad news about diseases we still can’t cure, and here you have this little story about something really good that can happen so easily,” Mullaney says. When no one in Hollywood bit, he settled for a documentary. He drew director Megan Mylan (Lost Boys of Sudan) into the cause, just as he had Wang—and they earned an Oscar.